The Kings XI Punjab today had a dream run as they continued to dominate the opponents for the seventh time in their home ground at the Punjab Cricket Association in Mohali. Ravichandran Ashwin’s men were all set to take on the Sunrisers Hyderabad today and home team enjoyed sky-high confidence as they went on to beat Chennai Super Kings in the last match. After winning the toss, KXIP opted to bowl first and invited SRH to bat first. The visitors had a horrendous start as they lost Jonny Bairstow right at the start of the game. The team reached the score of 100 in the 16th over and were quite slow in the major chunk of the match. However, David Warner was the lone warrior who remained unbeaten on the score of 70 and put the team to a respectable total of 150 runs. KXIP beat SRH by 6 wickets. In the second part of the innings KL Rahul remained unbeaten scoring 71 runs and formed a partnership of 114 runs with Mayank Agarwal after Universe Boss, Chris Gayle made way to the pavilion on the score of 16 runs. The match went down to the live wire as the home team lost three wickets in two overs. It was KL Rahul who went on to hit a four and then scored a couple in the last over, thus guiding the team to a six-wicket victory against Sunrisers Hyderabad. IPL 2019 Orange Cap Winner Updated: SRH's David Warner Continues to Retain the Orange Cap in the Indian Premier League 12. # This was David Warner’s sixth half-century against Kings XI Punjab. # Today David Warner's slowest 50 in #IPL (49 balls). # KL Rahul scored his 13th fifty in the IPL. 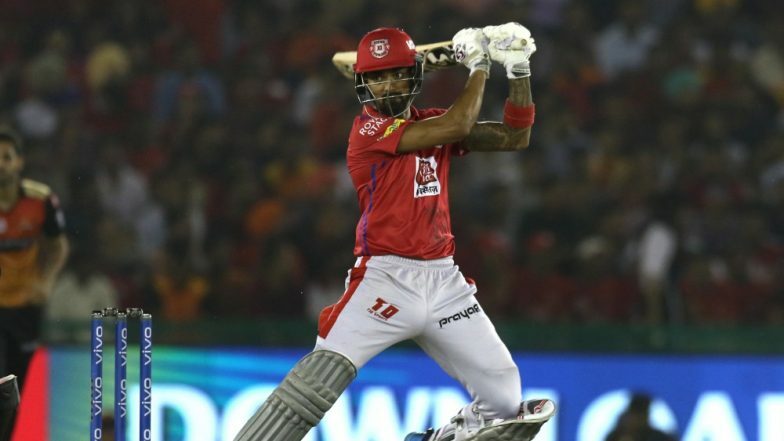 # KL Rahul has so far made three half-centuries in the IPL 2019. # Kings XI Punjab has won their seventh match at the home venue. KL Rahul was made the Man of the Match today for his unbeaten knock of 71 runs. “Didn't start off the way I wanted in the first couple of games. All the fifties have come in chasing and I am enjoying my batting. Been playing with Chris for a long time and have been playing Mayank since my childhood,” he said. With this, Kings XI Punjab is now on number three of the IPL 2019 points table. Sunrisers is now on number four.